I was very excited for my trip to Russia and wanted to do a multi-day overview of Moscow to start to get a feel for the city before I ventured off on my own. I found a great, 3-day tour of Moscow on Viator. I really lucked out with my guide, Alina. 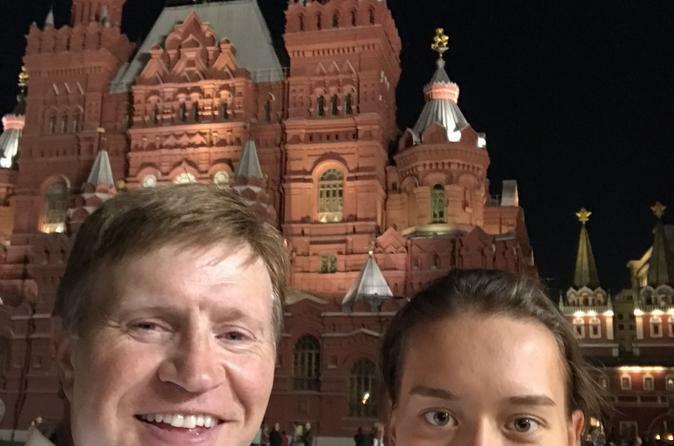 She was kind, responsive, and had an exhaustive knowledge of Moscow and its many sites. Alina was extremely flexible allowing me to set my own pace and go wherever and whenever I wanted to go. I almost hate writing this review because I want to keep her all to myself. Alinas infectious good humor makes her a delightful touring companion, not just a guide. When I return to Moscow, Alina will be the only guide I seek. Thank you, thank you, thank you, Alina, you made my trip!! You are the best!!! Walking about Moscow with English speaking local guides Julia, Kateya and Elena (3 days) turned out to be a great way to take in the sights and get to know the city on our first visit. They were professional and always on time. Their help during meals enabled us to enjoy some local cuisine. A terrific 3 days, certainly not the cheapest way to see Moscow but, the girls are great, very knowledgeable and helpful. 5 out of 5. Love the tour guides. They are friendly, knowledgeable about the city and can adapt their agenda to yours to best suit your needs. Also learned a lot about the Russian culture simply by having a casual conversation with the guides over lunch. Don't waste your time venturing on your own. Trust the guides. They can save you a lot of time. Three different guides, each was fantastic, each gave a personalized tour of the Kremlin and went out of their way to make sure we saw the things we wanted to see. There was no wasted time and very little time in lines, it was a fantastic three days in the City and we came away with a great understanding of Russian history and Russia today. Well worth the very reasonable price! The guides Tania, Anna and Irene were very flexible in finalizing the tour program and have given good guidance. They were very knowledgeable regarding the history of Russia and were very punctual. We had 3 excellent guides who spoke excellent English for 3 days. We visited many sights by way of underground trains and public bus which was a very good way to experience some part of Muscovite life and culture. The trains and bus are clean and on time. The people we met are courteous and friendly. We must have visited about 11 amazing underground stations, some of them look like part of a palace. We stayed at the National Hotel which is right opposite the Red Square and had the most amazing view when Russia celebrated its Victory Day on 9 May with military parades and fireworks. A note to remember, moving in and out of the area around the Red Square on 9 May is very restricted and you may not be able to get out of the hotel until the parade is over. There are very good western restaurants around the city and there is a very good food court right under the Red Square. 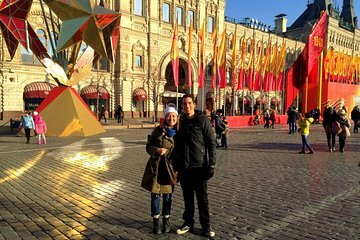 This was the first time we visited Moscow and its an experience well worth doing again. You'll be able to see all of Moscow's sights with this private tour. We had a different guide each day and each one gave us interesting and detailed explanations of what we were seeing. All and all an excellent three days. The tour guide will take care for everything and will adjust any schedules which will make you feel comfortable and happy during the trip to Moscow. Highly recommended. You can write any demand for Alina and she will provide good advice for you. Highly recommend. For anyone traveling a very short time in Moscow. I highly recommend this tour. Kate, Victoria and Karina were all very knowledgeable tour guides. Warning- there are a lot of walking involve, make sure to wear very comfortable shoes!